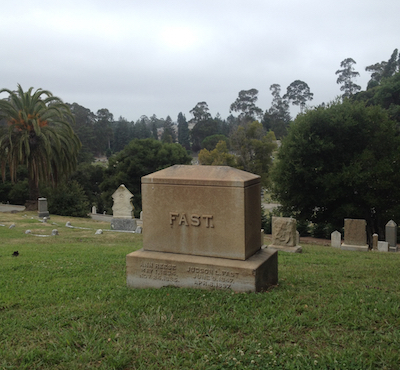 I sometimes walk in Piedmont Cemetery when I need to put things in proper perspective. It’s a great place to wander, and on a weekday morning like today there’s hardly anyone there. One thing that impressed me today was the fountains. They’re sprinkled throughout the grounds and they all have basically the same design, and they’re all running. The whole place is beautifully maintained and among the few people I saw there this morning were some dedicated groundskeepers. I noticed the sound of the fountains today, in a way I hadn’t fully appreciated before. It’s so soothing, so meditative, so nice. Running water, like the sound of a creek, I mean there’s a reason people meditate to sounds like that, recorded or by actual creeks. I realized that these fountains with their multiple spouts were perfectly designed to create a sound very much like a little waterfall. Or perhaps rain. It’s lovely. And as you walk around through the monuments and dedications to departed loved ones, you can always hear these fountains. You approach one fountain and it gets louder, as another fades to quiet behind you. It’s very musical and I took a moment to applaud the architects of this. I thought of my dad, naturally, as he was a composer and appreciator of found music in the tradition of John Cage. Like, you decide to hear the world around you as music, and thus it is. It’s a thought I’m grateful to have learned early in life, as it’s given me decades of fun and entertainment. I mean the sound of the freeway, right now, airplanes passing and echoing through the city, it’s all music if you want it to be. Easiest thing in the world. So in the cemetery I considered my dad at length, and had what I will call a nice visit with him. What I wasn’t prepared for before he passed, was the absolute permanence his presence would hold with me. At times I miss him terribly of course, but as often, as today, I simply hung out with him. We had coffee and a chat and wandered around, looking at stones carved with the names and dates of fellow travelers. The history there is endless. You pass one grave and you pass a lifetime of stories. Of love, of struggle, of success and failure, of relationships with so many other souls. And in these gardens there are thousands, and thousands, and thousands of these. I took some pictures and mused, there’s no way my dad could ever walk through a place like that and not take some photographs. I didn’t used to, I was far too lazy to mess with film and develop it. But instant satisfaction from my iPhone? Hell yes. In the course of my walk I realized that I’m doing more things like my dad as I get older, not less. Or maybe I am just noticing them more now. I don’t know. Like I said, he’s here, and that is just a trip. Someone said “What is remembered, lives.” I thought of that today and smiled, what an incredible thing is human memory. It can be awful, too. Best to do things you wont regret! As much as humanly possible. That’s the 1st one I snapped, that started my little “chat” with my dad. He used to refer disparagingly to movies or TV shows that he found unoriginal, as “Plot number 5.” He maintained that most Hollywood productions followed narrow plot templates and that they were making the same things over and over again. So when he reached a moment where a story seemed rote, he would grump “Plot number 5 again!” and turn it off. 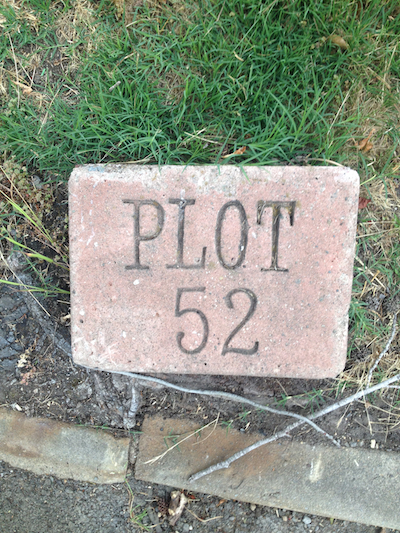 So, here we were at plot number 52. Random association and I’m going with it. A “chance event” as John Cage would say. I am a chance event. Me growing up in Berkeley was a chance event. My parents met in Germany and my dad had been accepted to the Hamburg Conservatory when they got engaged. But he also got accepted to UC Berkeley in the music department, and being that Berkeley was his hometown, it had a certain appeal. There were other factors involved, but my mom once told me it could have been a coin toss, at that point. So my brother and I would have been born in Hamburg. You can’t really describe two more different places in the 1960’s than Berkeley, California and Hamburg, Germany. Either one fine – I love Hamburg, I love Berkeley. Apparently, they had one of the coldest winters in living memory that year in Germany, as they were deciding. And California looked bright and sunny and warm. The Beatles were new and rock and roll was rock and roll, and Kennedy was president and Martin Luther King’s thundering voice was touching the hearts of men and women around the globe. America. It was a return, for my dad. For my mom, a new adventure. They actually sailed into New York Harbor, past the Statue of Liberty, after a journey across the Atlantic Ocean. Can you imagine? A few years later they were enjoying the Summer Of Love in Golden Gate Park, and my mom has told me the “Be-In” was the happiest day in San Francisco and all creation. I was there, I was two! I was a two year old hippie. I wonder, if I had been born in Hamburg, what would be different. Would I be a musician? Would I have different values? How different? Different how? It’s hard to know. My parents would still be their great selves, but how would we all have been different? The thought entertains me. As I walked among the stones, I marveled at how unique and brilliant a life is. And how random things can seem. One of my favorite John Lennon quotes is, “Life is what happens when you’re busy making other plans.” I recently used that in a new song, actually! Shamelessly took it for the chorus. Works well! Thanks John. Hmm. Three Johns in this post. My dad, Cage, and now Lennon. More chance events. When you’re four years old, a year is basically forever. The idea of doing something “next year” was meaningless to me. I lived right in the moment. This little house we lived in on Josephine Street in North Berkeley with its jungle backyard, was a vast universe of wild rumpuses and colors and light and music. God I was lucky to be born where and when I was. And to have such sweet and creative parents. And friends. I’m very grateful. I’ve got a song on my EP called “Dad.” It’s about my dad. Subtle, no? I wrote it about a year ago and it’s a wild, short punky ride. It has all the love and pain and anguish and glory it ought to have, and it wrote itself very, very fast. I recorded it with Mikey and Bennie (a mini-Uptones if you will!) a week later. That tune was a doorway for me, somehow. Whatever was left of my writers block, was obliterated by that song. See, I love it when OTHER people write personal, soul-searching confessional stuff. But me?! You want to know what’s going on under the hood with me?! Noooooooo!! I write topical stuff, political songs, hell, I only recently wrote my first girls-name song! “Sweet Lacy Anne,” it’s also on my EP. But to delve into the darker scarier inner bits like therapy? To plow the minefields of one’s mind and let out the gnarly bits? I leave it to Bob Dylan. Hell, John Lennon! Dude was fearless about it, just let it all hang out. He’s the most famous person I ever thought I knew personally, just from his work. And after my dad passed, and I wrote that song, I realized that I’m not afraid to do that sort of thing anymore. If it happens to be entertaining, great, but I’m letting it out so it wont stay in here. It’s a sunny summer day in 2017, fifty years after the Summer of Love. When I was a baby, and a young kid, the Beatles were not just my favorite band, they were my favorite anything. 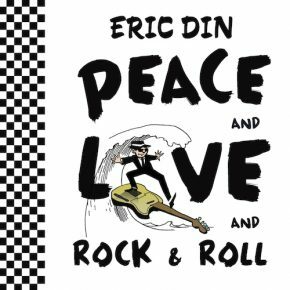 “All You Need Is Love,” “Can’t Buy Me Love,” “And I Love Her,” Love, Love, Love, Love, Love. What a marvelous message to start ones life to. I’m glad to carry it. Oh, there were turkeys at the cemetery. No way my dad would have passed them without taking their picture. Long live rock, be it dead or alive. it touches me deeply what you wrote. As your aunt, your mother’s sister, I recognize much of it, having often joined you and your family in California, sometimes in Germany and also in Mexico. It brings up part of my history too, leaving Germany almost at the same time your parents did, settling in another country, Mexico and grateful that your mother and all of your family is not to far away. Much more to say, but I leave it for our next meeting hopefully next month.